Reader Cydne wrote in because she's heading to France in May to celebrate her anniversary and 30th birthday! They will be in Paris and also driving through the French countryside. 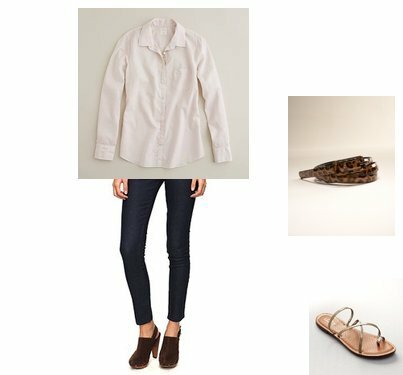 She wants outfits that are comfortable for day and stylish outfits for evening (dinners out, etc). She loves Lauren Conrad's style, maybe with some Kim Kardashian thrown in for nighttime. She wants to have one "wow" outfit for an evening dinner (she plans on buying some black Louboutin's while in France, so maybe a dress that would go with those). She also is looking for a small messenger bag purse to carry during they day in either camel or black and under $100. Here are the outfits I emailed her, you can click on any image for more information unless otherwise noted. You can click HERE for the Forever 21 cropped denim shown in several sets. If Cydne wants to, she could swap out the tank in this set for one she already owns, or even a v neck tee. 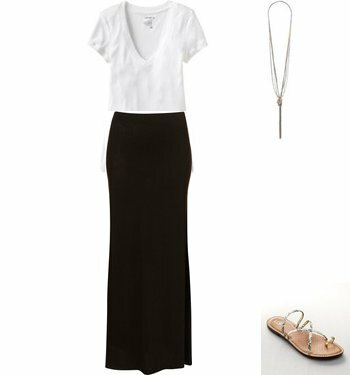 She could throw on a white blazer (seen in one of the last sets) and swap out the wedges for some gold sandals like these to make it a little dressier. Inspired by THIS Olsen look which I LOVE. I love this top from J Crew with the subtle sequins on the placket of the top. This dress would work for day, or evening (throw on the gold heels mentioned earlier - click HERE to view). And here's the killer evening outfit, a white blazer thrown over a body hugging cocktail dress (there's the Kim K influence!) and some gorgeous Louboutin heels (yet to be purchased by Cydne). After living in France (in the countryside) for awhile one thing I would recommend is scarves - especially pashmina types. It's a pretty damp climate and I remember finding that I was cold a lot. Tying a chic scarf and just having one handy will be handy for chillier nights and help you look like a local :) Have a blast! Thank you so much! I love all of the outfits! I can't wait to start shopping for my trip!